Knowing how to look up an Australian business online is an important skill. A company is a legal entity, it can sue and be sued, but you can't sue a business name. And if you sue an someone personally but you really meant to sue a business, then you've wasted time and money in court. ASIC = Australian Securities and Investment Commission. Now you may want to look up an Australian business online for a number of reasons, below are some examples. For a business contract to be legally binding, you need to record the correct parties business details. So it's a good idea to look up a business and make sure that you are have their correct details. If you ever need to take legal action against a business, you need their correct details on your court paper work. Understanding if your business partners has a registered Australian business is important before you do business with them or buy a business. So here’s a practical guide to looking up an Australian businesses online. Let’s start with an ABN lookup because we can get a lot of information from this lookup. You can complete a search using the business name or ABN. For this example, we are completing a lookup using the business name "collective hub"
Here are what the search results look like on the next screen. You can click on the correct business name to get more detailed information. In the next screen pictured below, we can see business details including: the company name, the fact that the company is private, the company registration date and the registered business names used by the company. 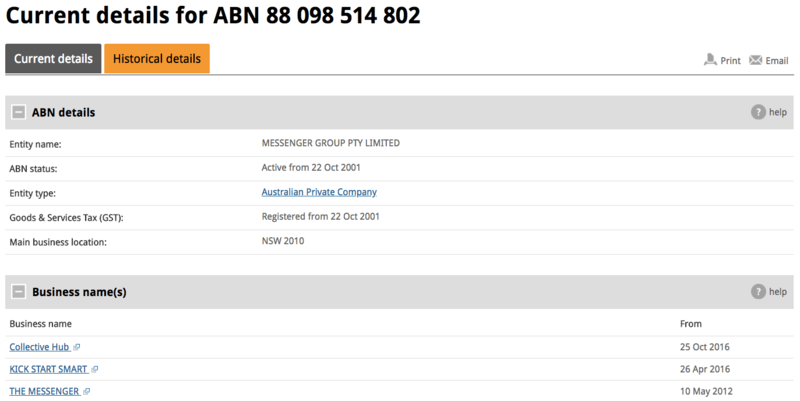 So in this example, the correct legal entity is Messenger Group Pty Ltd and it uses a number of business names such as Collective Hub, Kick Start Smart and The Messenger sometimes referred to as trading as names or t/a in short form. If you are looking up a sole trader, you won't need to complete any of the extra steps for ASIC as described below. 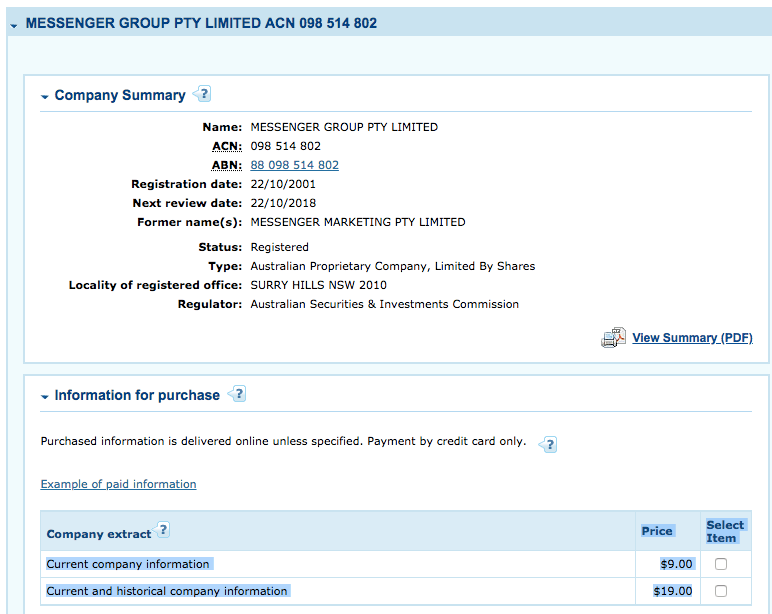 Now that you know the company name, you can go to the ASIC website and lookup the entity "Messenger Group". 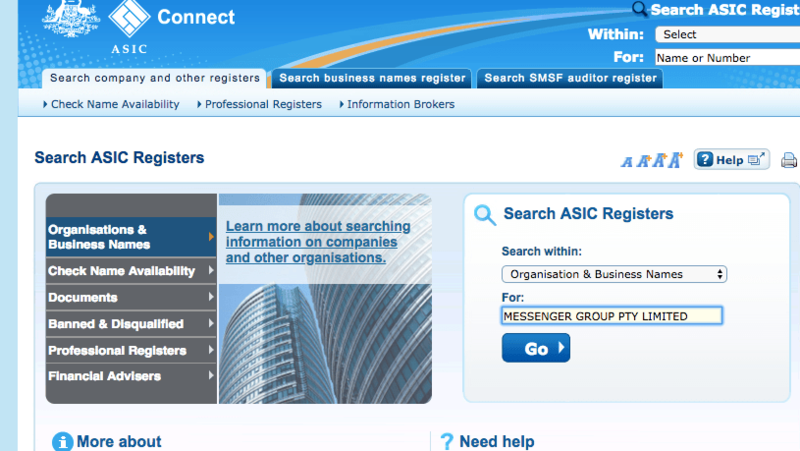 On ASIC's homepage, you can go to the right hand side of the screen and select Companies and organisations. The next screen looks like the one below. Select Organisation & Business Names from the drop down. And in the box below the dropdown, enter the company you are searching and click Go. In this example, we are searching for Messenger Group. Next, you will see the search results in a screen that looks like this one below. You can select the correct company to get more information about its director, shareholders and registered address. When you click on the correct company name, you can see extra company details like the ones below and you can select either a current company report or a current and historical company information report. We have samples of each report attached so you can see what each report will look like before you buy. Includes guide & sample lookups: ABR & ASIC and sample extracts.